I think this is going to be the norm now. A post a month. Read posts when I have time, plan to comment later. Then when I login with the intent of commenting on posts, I see about ten other new posts that I have to catch up with! Really, sometime I am amazed, how we hardly get any weekends off for just ourselves! I had about a hundred or more fights with Bg, about how we have not gone anywhere in the two years of being married, how we have never taken a vacation for ourselves. I have kept asking Bg to plan for a Goa trip. But he keeps putting it off, saying we’ll be bored if we go only as a couple and it’s a place where we should go in a group. With others backing his opinion, the Goa plan fell flat, even before it got kicked off! 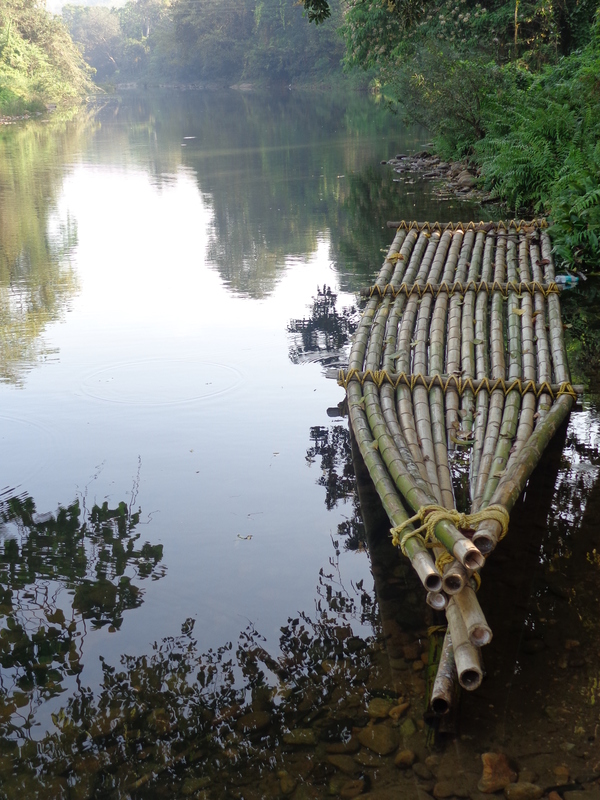 But he suggested we go to a home stay near Dharmasthala – Stream of Joy. He had been there with his friends a few years back and said it’s a nice place to go and relax. Our birthdays fall on consecutive days. His on the 13th of Feb and mine on the 14th. We planned to take a day off on Friday and head off for the weekend. But as luck would have it, I had too much work at office! I had to deliver my code fixes by Thursday evening if I wanted the Friday off. I kept working and working, even worked in the cab on the way back home on Thursday evening. I finished off just in time to leave on Thursday night. We even took the laptop along, anticipating work! We drove in our own car and hence the liberty of leaving late on Thursday night. We stayed at his cousin’s place for the night. It was about half way to the destination. Started on Friday morning, post breakfast and drove straight to the place, except for one break for coffee. The lovely place welcomed us. 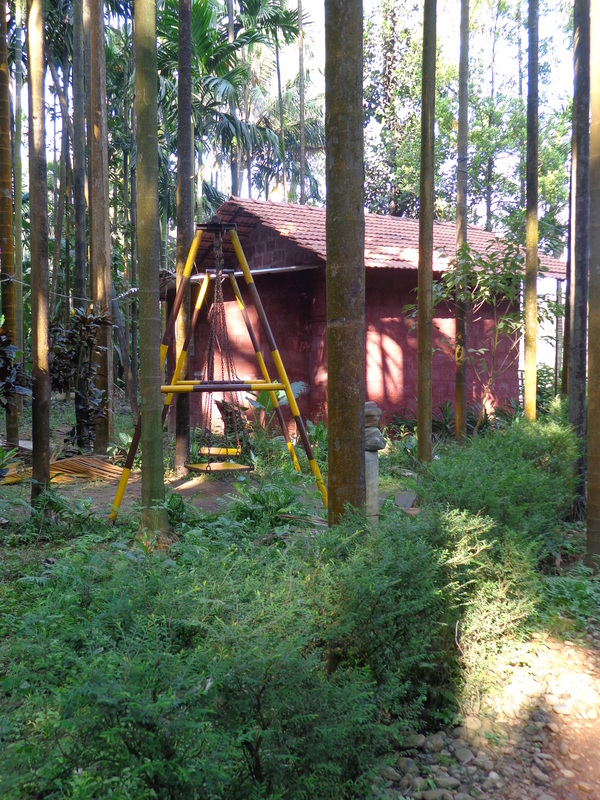 Amidst a green arecanut field, just adjacent to his own house, the owner has built 4 cottages. Two of them were occupied and one was under renovation. We were shown our cottage. Simple and beautiful! We made ourselves comfortable. Had some coffee, took some rest and then were off with the owner and the couple in the other cottage for fish feeding. 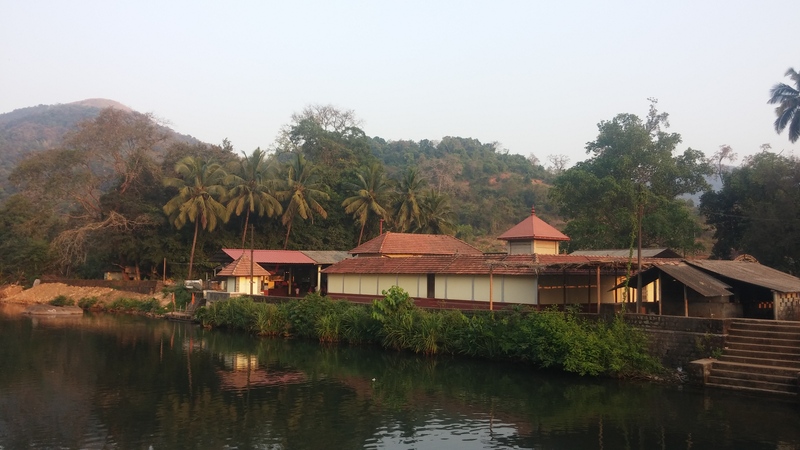 Kapila river flows adjacent to the temple of Shishileshwara, which is about 10 km away from the cottage. Huge number of fishes are found there, as fishing has been prohibited since a long time. 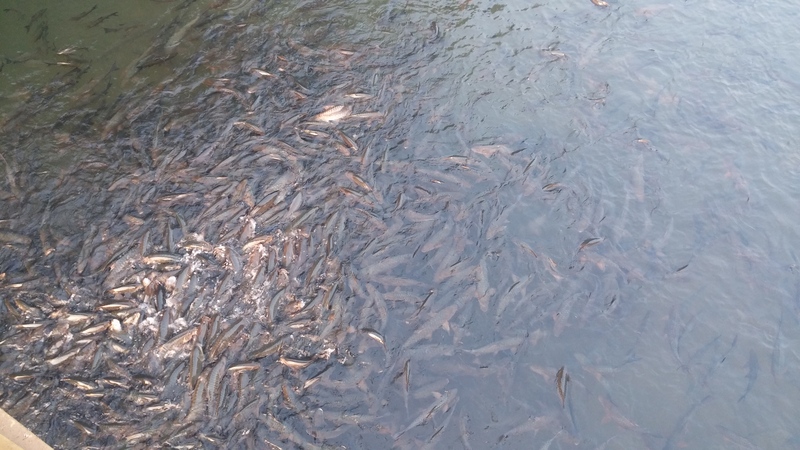 Feeding these fishes with puffed rice, is one of the activities of the owner. Apparently he has been sponsored by someone to do the same, regularly. It was amazing to see the fishes jump on each other to eat the treat! Look at the number of fishes!! 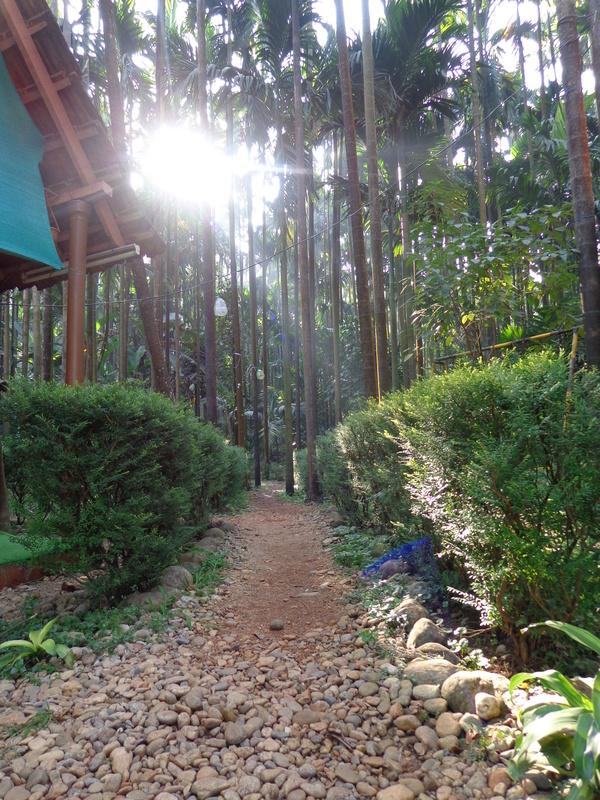 The gravel laden path leading to our cottage. Previous Post The year that’s gone and the one that’s ahead..
Wow. Simply wow. I so want to be in that cottage now. The pictures are so beautiful Arch. Wishing you a very happy birthday, belated though. I’m glad you got a break and wish you get to go Goa soon. I would love to visit Goa too and its not happening at all. 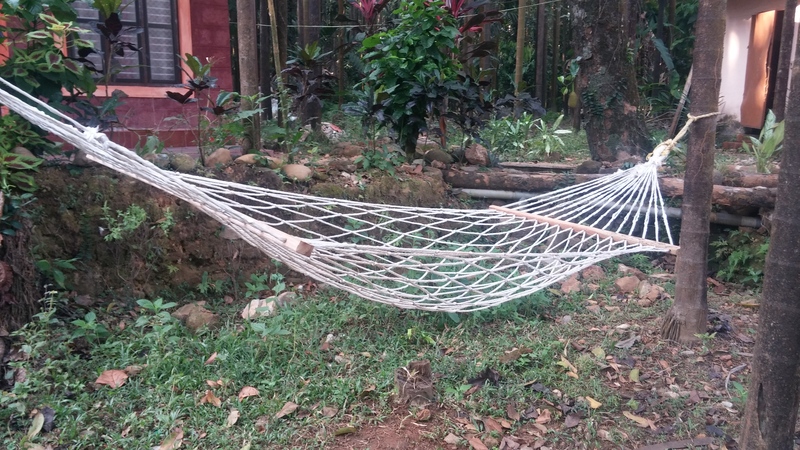 We were to go to Goa only for the anniversary but then we had to settle for Chikmagalur. I just saw.. There were so many typos in my reply! It looks like a lovely place! I googled it right now, Cuz I had no idea where it is. May I suggest something? Goa is fun as a couple/small group/ family, in every way. If both of you go, you guys can rent an activa, roam around like college kids and can do activities freely. 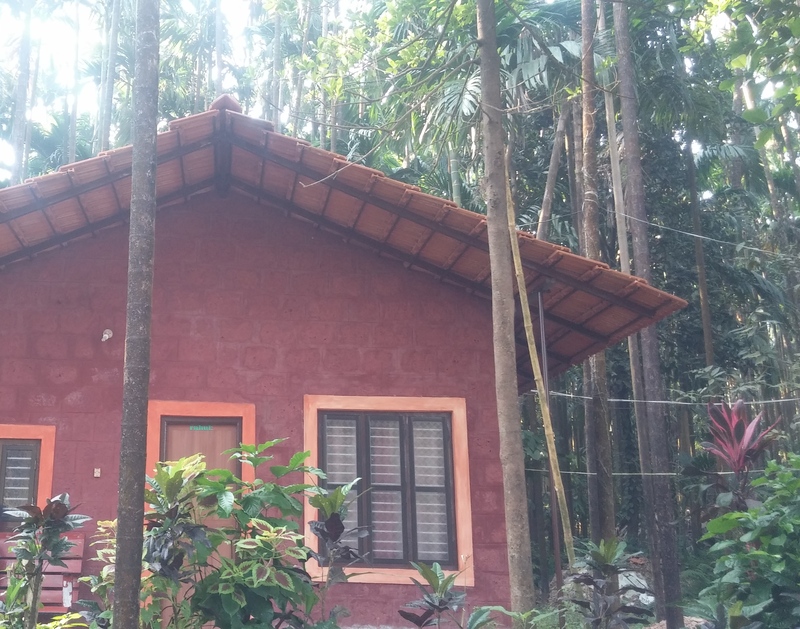 Stay in a homestay on calangute or condolim. My parents stayed in Condolim, on a walking distance to the beach, rented an activa, went to the spice garden there and all. When I went with my girls, I just got drunk a lot. I did a lot of water sports, and so did mommy and daddy! Thanks for those details btw. 🙂 I will research more before asking him again! wowo lovely pics , indeed a beautiful place.. I myself so want to go and see GOA never been to it ..
and hey Happy brithday and many happy returns of the day ..
Belated birthday wishes Arch and what a lovely vacation that was. I am glad you guys were able to make it. Thanks so much Tharani! 🙂 I really hope we get to go to Goa sometime soon!! i think my comments on your blog are going missing. i remember reading this post and writing a birthday wish for you. i also recall commenting on your latest post, but dont see either of them now. oh well. belated birthday wishes, arch. 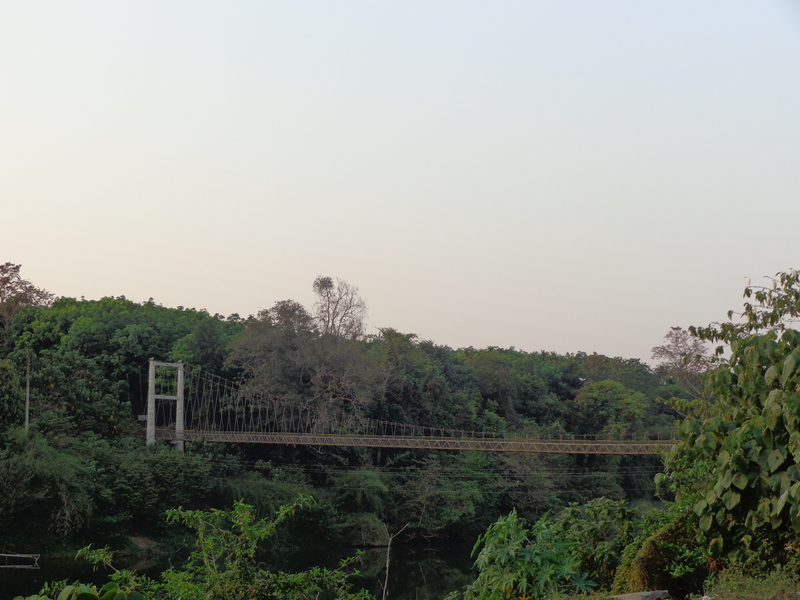 the photos are wonderful; i would love to go see that hanging bridge. I wonder what’s with the disappearing comments??!! I remember Pepper mentioning something similar on her blog. Guess it happening to some of the WP users..
Beautiful pics. Looking forward to reading your other posts.